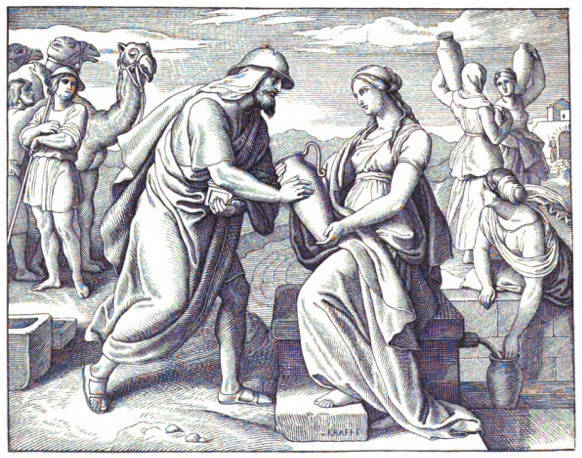 Abraham's servant and Rebekah by Julius Schnorr von Carolsfeld. Abraham's servant and Rebekah. Genesis ch. xxiv. ver. 17. Artist: Julius Schnorr von Carolsfeld. Source: The Art-Journal (1851): 58. “Examples of German Artists.” Art Journal (1851): 58-59. Hathi Trust Digital Library version of a copy in the University of Michigan Library. Web. 28 July 2013.